If you have just used AutoCAD 2009 - 2015 from an earlier version of AutoCAD you may have come across the new menu system called the ribbon menu. It directly emulates the feature brought into later versions of Microsoft office. Love it or hate it, it is there. 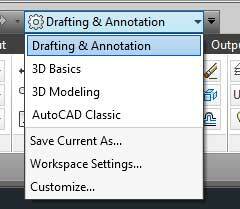 But you can get the old style of AutoCAD menus back if you prefer in 1 easy step. It is also possible to have a combination between the new ribbon menu and the old menu bar. To do this, change back to the ribbon menu by selecting Drafting and Annotation from the drop down box we used in the previous step. This will bring up the new ribbon menu. You will now have the Ribbon menu with the Menu Bar.